Bloodshed of Eagles is a fictionalized account of the Battle at Little Big Horn, while using historical aspects throughout the pages, the reader is taking on a journey to the very slaughter of General Custer's last stand. Falcon MacCallister is pressed upon by Zane Grey and Custer's wife, Libbie, to share the stories of his yesteryears and the time he spent in the company of General George Armstrong Custer. When Colorado joins the union, Falcon MacCallister is made Lt. Colonel of the Home Guard and before he can even settle into his position, a cache of Winchester repeater rifles and two Gatling guns go missing. Before they fall into enemy hands, namely, the Sioux, Falcon sets off on tracking down the missing weapons. Authors William and J.A. Johnstone capture life in the old west, the personality of Custer and the rigors of army life with clarity and perception. The reader is left shaking their heads over the outcome of Custer's last battle and wonder if he could have been reasoned with, would the outcome have had a different result. The fictional character of Falcon adds to the overall believable integrity of the story, by showing us a up close and personal side of the battle that is left out of the history books. Included at the end of the story is a list of all the men who perished with Custer on that fateful day, giving an extra human edge to the story. As well, where applicable, the actual letters exchanged between Custer and his wife, Libbie are shared with the reader, including the last letter that he never received, in which Libbie shares with him her trepidations about the upcoming battle. I liked the historical aspects of the story and had to remind myself they were one sided only because General Custers side of the story was being told. I liked how the authors made Custer as I have always imagined him to be, brash, arrogant, pig-headed and military minded, with just a touch of the human side appearing whenever he was in the presence of his wife. 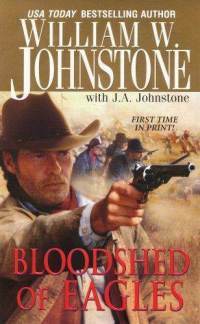 If you like historical western then you will enjoy Bloodshed of Eagles. Falcon MacCallister never thought he'd wear army brass. But Colorado is about to join the Union - and the would-be state has just made him Lt. Colonel in its Home Guard. Then, before his military career can take off, Falcon loses one of his men and two deadly new Gatling guns to a murderous ambush. Falcon is going to get those Gatling guns back - before they kill the wrong people. Tracing the missing guns to Eastern Montana, Falcon teams up with a scout named Isiah Dorman. Falcon and Dorman are spearheading a battle against the Sioux - in the shadow of the disastrous Little Big Horn slaughter. For the two men, survival along the Little Bighorn is going to mean breaking rules, standing strong, standing together - and holding off a deadly onslaught with only a few guns against many.